Client and agencies worked together closely to develop the FLING® brand strategy and communications brief. When it came to developing the advertising, all agreed we needed a big idea that would successfully launch this flirtatious new chocolate bar. We’re all brought up on Fairytales. The handsome prince and the beautiful princess always end up together, against all odds, and live happily ever after, forever and ever. 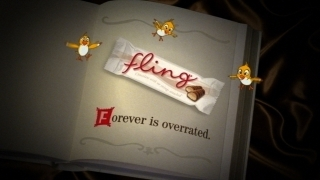 Only, we’re about to launch a product called FLING®. It’s a chocolate bar that’s only a light flirtation. It’s not a full on commitment. It in no way lasts forever, or hangs around. It’s delicate, momentary then dissolves away. So, we’ve created a campaign that toys with the idealism of forever – it’s called Forever Is Overrated ™. We took what we girls know as the classic representation of “forever”, placed it in a contemporary world, and let a classic fairytale scene play out how it would today.